JKUSS is a premium designer brand from Korea. It was launched in 2009 by a professional fashion designer, Alex J, and his team with a the motto "Good design stands out, gets loved and remembered anywhere, anytime"
JKUSS products have won recognition from many countries worldwide with designer patterns that make the products look glamorous, fashionable and memorable. Manufacturing is done in limited quantities to ensure we only produce top quality products that won't disappoint. 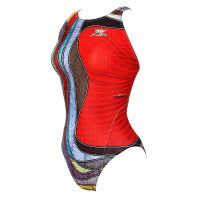 So whether you are a racer, or a casual swimmer, have a browse of our full range of Women's and Men's swimwear. We also stock JKUSS swim caps. 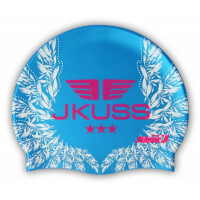 A aqua blue silicone swimming cap with a pink JKUSS logo ..
JKUSS Progressive SL-04W swimsuit in red and multicolour. 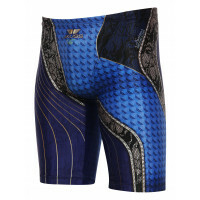 It has ..
JKUSS Specialize SPE-03M Jammer swimming trunks in black, red and..